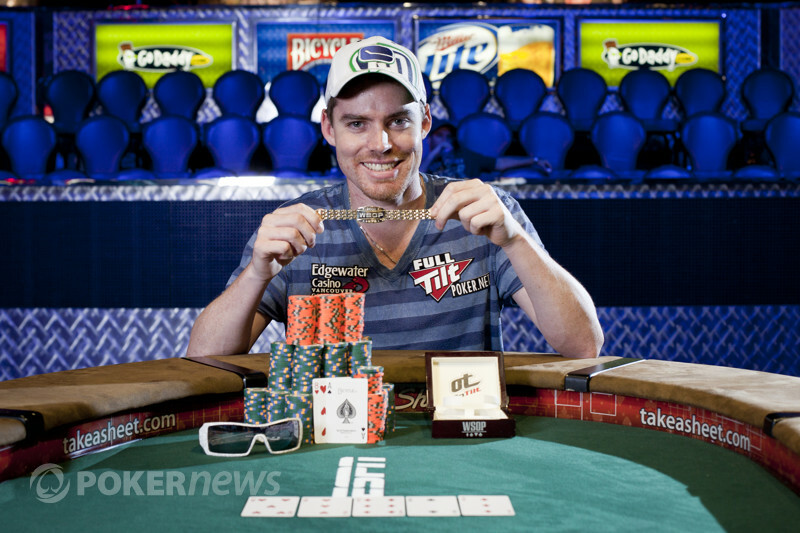 Following the footsteps of all of the other "November Niners" since 2008, Matt Jarvis became a well-known entity in the poker world after making the final table of last year's WSOP Main Event. While he'd depart from that table in eighth place -- in one of the more memorable hands in WSOP history versus Michael Mizrachi -- Jarvis nonetheless earned lasting fame from his performance, not to mention a million-plus dollar payday. But with today's win in Event No. 40, the $5,000 No-Limit Hold'em Six-Handed event, Jarvis has ensured himself instant respect as well for having bested one of the toughest large-sized fields the WSOP will likely see this summer. Today's runner-up, Justin Filtz, should also gain some acclaim for his performance as well. Filtz enjoyed the chip lead for much of Day 3 and for part of the three-plus hours he and Jarvis battled heads-up last night and today. While he's surely disappointed in coming up one spot shy, the almost half a million dollars should help him get over it somewhat. Jarvis is still beaming as he stands on the stage giving final interviews, clearly satisfied with having closed the deal here after being unable to do so last November. Jarvis collects $808,538 for his victory, his win marking the fifth by a Canadian at this year's Series, the most by any country other than the U.S.
Congratulations to Matt Jarvis, Event No. 40 champion! 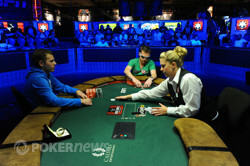 And thanks for following the coverage on PokerNews. Matt Jarvis Grabs the Loot! 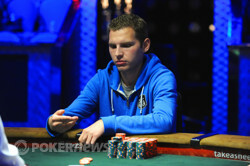 Justin Filtz Eliminated in 2nd Place ($499,855); Matt Jarvis Wins! On the fifth hand of Day 4, Justin Filtz had the button. 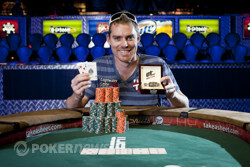 He checked his cards, and without too much deliberation announced he was all in for his last 2 million. Matt Jarvis immediately called. Jarvis had the preflop advantage. Both players stood behind their chairs to await the delivery of the community cards. "Ace!" cried the Jarvis supporters. The flop came . "Hold!" came the revised cheer. The turn was the , and Filtz was down to one last chance for a saving king or nine to win, or a four to chop. The dealer burned and turned over the river -- ! A loud roar erupted from the stands, and Jarvis, fist in the air and a huge grin on his face, raced over to hug his supporters. He soon walked back over and shook Filtz' hand, with both agreeing it was a tough, memorable battle. It's over! After three long hours of heads-up last night, Day 4 concludes in less than five minutes with Justin Filtz taking second and Matt Jarvis winning his first WSOP bracelet! The first three hands of heads-up saw a couple of button folds, then a raise-and-take for Matt Jarvis. On the fourth hand, Jarvis limped from the button and Justin Filtz checked his option. The flop came . Filtz checked, Jarvis bet, and Filtz called. Both checked the turn. The river then brought the . Filtz carved out 280,000 chips and set them forward, and after a bit of a think Jarvis made the call. Filtz showed for a busted straight draw, while Jarvis had for a pair of fives. Jarvis bumps up close to 9 million, and Filtz down closer to 2 million. Announcements have been made, a crowd is starting to gather, and the first hand of Day 4 is being dealt. Welcome back to Event No. 40, the $5,000 No-Limit Hold'em Short-Handed event. We're down to just two players, 2010 November Niner Matt Jarvis and Justin Filtz. When play resumes shortly, Jarvis will enjoy a better than 3.5-to-1 chip advantage over Filtz, which might suggest the possibility of a short Day 4. But if their epic, three-hour long heads-up battle last night proved anything, it is that these are two tough competitors neither of whom will likely be impatient to finish. The scheduled start time has been pushed to 2:45 p.m. local time -- about 10 minutes from now. Stay tuned for coverage of the conclusion of Event No. 40.